ed islands within the group and also some uninhabited volcanic ones. The capital is Praia (on Santiago) and Portugese is the official language. The major port is Mindelo on the island of Sao Vicente. There is a recently opened international airport in Praia and a second international airport (Amilcar Cabral) located on Sal Island which is about 150 kms northeast of the capital. Generally the facilities for tourists are still quite limited though improving and most developed on Sal. The climate is oceanic tropical with temperatures varying from 20oC to 30oC throughout the year. The light rainfall tends to occur in Aug to November. During this time humidity can be higher but this is not usually a significant factor. In line with many hotter regions of the world the level of food and water hygiene varies greatly from area to area and depending on the establishment. Travellers are advised to eat freshly cooked hot food, to avoid cold meals (salads etc) and particularly to avoid any undercooked bivalve shellfish meals (clams, mussels, oysters etc). Fresh milk may be unpasteurised and should be avoided. As with many archipelago destinations there is a way of moving from island to island if you wish to explore. This can be by boat or plane in many but not all cases. However if travelling by plane be aware that the limited baggage handling capacity of the small planes may lead to some delay in eventually receiving your luggage. During the dry dusty season (December to April) flights may be cancelled due to poor visibility. The road traffic moves on the right and seatbelts are compulsory for all in the front seat. Motorcyclists must wear helmets and have their lights on at all times. The majority of accidents occur because of unlit narrow winding roads, aggressive driving and alcohol impairing the senses. There are a large number of festivals and around these times alcohol intake increases considerably with the resultant increase in danger for all road users. The emergency numbers are 130 for medical assistance, 131 for fire assistance and 132 for the police. There is no organised roadside assistance and travellers are strongly advised to avoid hiring cars or motorbikes. Taxis and buses provide a reasonable service and are a much safer option. Many travellers from Europe will enjoy the beautiful climate to excess and run the risk of severe sunburn and dehydration. This is particularly true for the first 24 to 48 hours after arrival (when the traveller may fall asleep under the glaring sun) and also for young children. Sensible covering, avoiding the midday sun and replacing lost fluids and salt are essential to maintain your health. Island life in the tropics tends to increase the amount of water exposure for many tourists. It is important to check out the facilities (both the professionalism of their personnel and the equipment) before undertaking any water sports. Talk to others who have already taken part or your holiday representative and listen to their experiences. This will help you make the right choices. Remember the tides and currents around the various islands can be very strong so always follow local advice and never swim alone. Watch children carefully. This island chain has only a few species of mosquitoes and the risk of malaria is thought to be negligible. WHO (2006) does not recommend prophylaxis for travellers but comments that there is a mild risk on Santiago mainly between August and November during the rainy season. Good repellents should be used by all travellers - especially at dusk and dawn. Unfortunately there is no idyllic destination throughout the world and petty crime occurs in Cape Verde as elsewhere. Take special care at festivals and in market places. Don't flaunt your personal wealth while out and about. Gangs of children have been involved in attacks against tourists so avoid any potential confrontation. Travelling directly from Europe there are no essential vaccines for entering Cape Verde. It is a Yellow fever risk region but there have been no cases for many years. Other vaccines need to be considered against food and water borne diseases such as Hepatitis A & Typhoid. In a follow-up on the locally transmitted malaria increases reported on Cabo Verde [Cape Verde] this year , 254 indigenous cases were reported through [24 Sep 2017]. Most cases (75 percent) have not sought treatment until 48-96 hours after illness onset. Despite this, case fatality rates have remained low (0.4 percent), with one death reported in an indigenous case to date. 7 severe malaria cases and 2 cases of malaria in pregnancy have been reported. There are also anecdotal reports of recrudescence. To date, the disease has been localized to the city of Praia on Santiago Island without any further spread. A handful of cases have also been detected on neighbouring islands (Sao Vicente, Sal, and Porto Novo); however, their infections were likely all acquired during travel to Praia or overseas, with no evidence of onward local transmission. The malaria epidemic in Cabo Verde has begun to show early signs of improvement but the situation remains tenuous, with heavy rainfall continuing between August and October, health officials said. Following an increase in malaria cases, additional malaria prevention advice for some UK travellers to the capital city of Praia in Cape Verde is recommended. Since June 2017, the Ministry of Heath for Cape Verde has reported an increase in locally acquired malaria cases in the capital city of Praia on the island of Santiago. As of 5 September 2017, a total of 164 locally acquired falciparum malaria cases have been reported in the local population . Currently, there are no reports of malaria in tourists who have visited Cape Verde in 2017. Those travelling to Praia who are at increased risk of malaria e.g. long term travellers, or those at risk of severe complications from malaria: pregnant women, infants and young children, the elderly and travellers who do not have a functioning spleen, should consider taking anti-malarials and seek advice about which antimalarial is suitable for them from their travel health advisor. The Portuguese health department has advised pregnant women not to travel to the Cape Verde island of Santiago [where the capital, Praia, is located], and if travellers cannot put their journey off, they should take anti-malaria drugs. The health department warning comes after the World Health Organisation (WHO) said in August  that there was an outbreak of malaria in Praia, the archipelago's capital. Travellers are also advised that adults and children should use insect repellent throughout the day and reapply it as often as necessary. If travellers also use sun cream, they should apply the insect repellent on top of the sun cream, not under it, the warning said. So far, there have been 116 cases of malaria in Praia, numbers never before seen in the city, where the highest number was 95 cases in the whole of 2001. [The Cape Verde authorities reported 45 cases of malaria up to 30 Jul 2017 (see archive no. http://promedmail.org/post/20170808.5236283). During the past 5 years, an average of one locally acquired case annually of malaria has been reported in Cabo Verde, or Cape Verde. In 2017, between [30 Jun and 30 Jul 2017], 45 indigenous cases and one imported case were reported, all in the capital city of Praia, Santiago Island. More than half the cases are reported in adult males. The causative agent has been confirmed as _Plasmodium falciparum_ using both microscopy and rapid diagnostic tests (RDTs). Preliminary investigations have attributed the recent increase in local transmission to several factors, including suboptimal vector control strategies, possibly coupled with inappropriate use (incorrect dilution) of a new insecticide introduced into the country in November 2016; the unauthorized installation of a rice paddy field in the affected area; and an increase in mosquito breeding sites within construction zones of a shopping centre and houses. The local authorities are in the process of removing the paddy field as further investigations are ongoing. 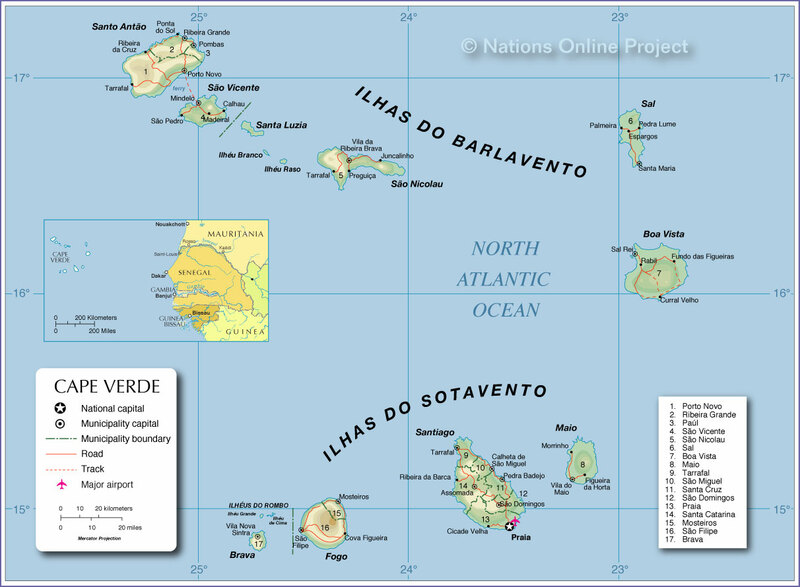 Cape Verde is a low malaria transmission country, eligible for elimination of the disease. With limited underlying immunity, all people (irrespective of their age group) are at risk of infection and of developing severe disease. Praia, Cape Verde, May 24, 2016 (AFP) - The only African cases of the Zika virus strain linked to surging cases of neurological disorders and birth defects are under control on Cape Verde, the Atlantic island's health chief has said. The World Health Organization on Friday announced that the Zika virus strain circulating in Cape Verde had been shown to be the same as the one behind an explosion of cases in the Americas. Tiny Cape Verde is the only African nation affected by the so-called "Asian strain", detected through the sequencing of the 7,500 Zika cases confirmed there. National director for health Tomas Valdez told AFP on Monday night there had been an abrupt drop in the number of cases since the first recorded in October 2015 thanks to a series of successful public health campaigns. "The epidemic has been progressively curbed," Valdez said. "In January suspected cases went down, in February and March even more, and in the last week we have counted just four cases, with zero cases some days," he added. The internationally renowned Institut Pasteur in Dakar, Senegal had helped set up a laboratory in Cape Verde's capital, Praia, to track all the pregnant women on the archipelago infected with the virus, he said, while extra travel precautions were in place. "We are doing everything according to international health regulations to guard against the spread of the virus to neighbouring countries and beyond," he said. Three cases of microcephaly have been recorded on Cape Verde but none of the rare but serious neurological disorder Guillain-Barre Syndrome, also caused by the Zika strain. In Brazil, the hardest-hit country, more than 1.5 million people have been infected with Zika, and nearly 1,400 cases of microcephaly have been registered since the outbreak began last year. Researchers estimate that a woman infected with Zika during pregnancy has a one-percent chance of giving birth to a baby with the birth defect.